This year, we started doing weekly flowers for a couple of small businesses here in Baltimore. It’s been a lot of fun showcasing the changing seasonal flowers week to week. The best part of using local flowers, is seeing the seasons change through the flowers that are available. It was this experience, that inspired me to start a “Flowers of the Month” club. This monthly offering will showcase the freshest, seasonal flowers available in Maryland and Virginia. Once a month, Local Color Flowers will deliver a flower arrangement to you filled with flowers, herbs, branches, foliage and other natural goodies available that month. Along with your flowers, you’ll receive a list of flowers that are in that month’s arrangement along with stories and photos from the farms that grew your flowers. Custom: Choose at least three consecutive months for your monthly delivery. This is a great way to customize your delivery based on your favorite season, or as a birthday, anniversary or holiday gift. This is a great treat for anyone who loves flowers and wants to experience the full bounty that our beautiful region has to offer. Buy Local this holiday season! Lauren and Brian’s wedding was such a treat to work on! They were married on Memorial Day weekend at the Baltimore Basilica. The bride looked amazing! 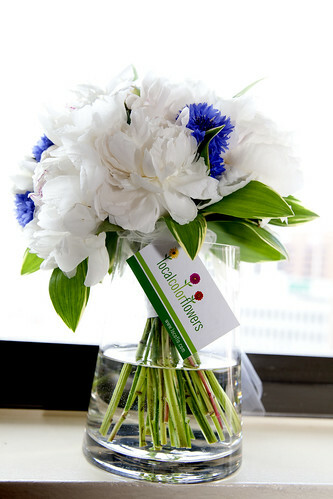 She carried a beautiful bouquet filled with white peonies, blue bachelor buttons and green Solomon’s seal. 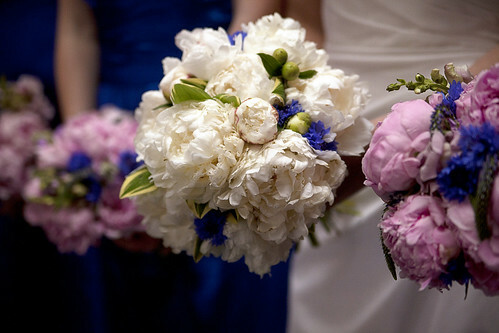 The bridesmaids carried similar bouquets with pink peonies. They looked so beautiful against their blue dresses. 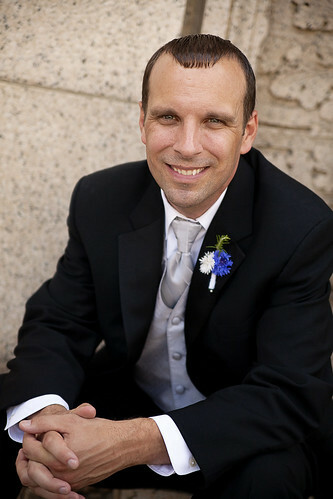 Brian’s boutonniere was made with a single white and a single blue bachelor button with a little sprig of rosemary. The centerpieces were made it two sizes of glass cylinders. 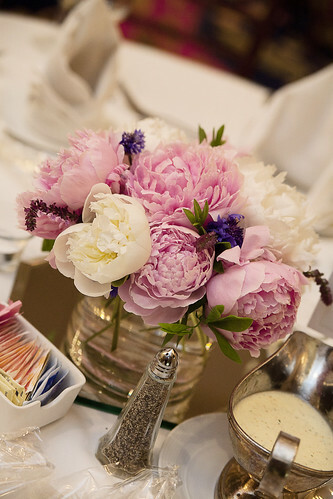 We used simple vases so that the flowers were the shining stars on the table. 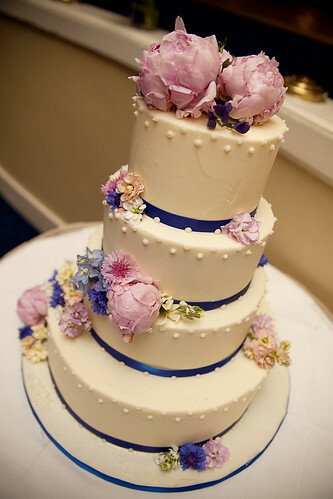 The cake looked great with peonies, delphinium blooms and bachelor buttons. Thanks to Wollam Gardens for the beautiful flowers! Special thanks to Kathleen Hertel Photography for sharing these amazing photos with us! 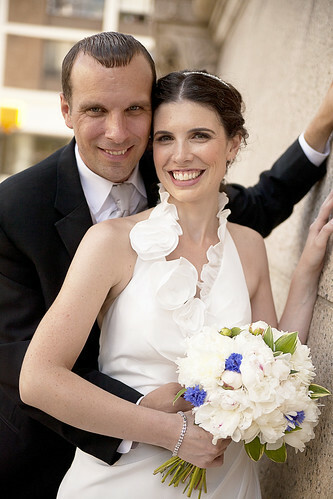 To see more photos from Lauren and Brian’s wedding, check out our flickr site! Congratulations to Lauren and Brian! Wishing them many years of happiness! 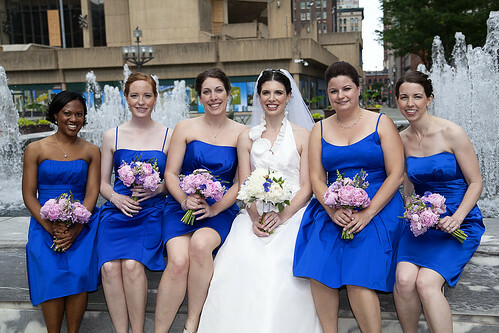 At the end of June, I worked on charming wedding here in Baltimore. Ikumi and Chris were married on a beautiful June evening at Gramercy Mansion. When I met with Ikumi to talk about flowers she mentioned wanting shades of purple for her bouquet. This was an exciting challenge to me because I couldn’t wrap my head around monochrome purple. Purple means something different to everyone. When asking the growers for purple that week, the shades were all so different. At first, I tried to leave out the phlox and balloon flowers that looked more blue against the bee balm. I liked how it looked, but it looked a little …boring. I added in the more bluish purples, with the green mountain mint and I think it really made it alot for interesting and really beautiful. Ikumi and Chris had small dinner reception at the Charleston, one of my favorite restaurants in Baltimore. I loved the centerpieces we made for the dinner tables because the included Bells of Ireland. Everyone loves Bells of Ireland for their bright green color and weird suction cup “petals”. Locally, Bells of Ireland are only available for a few weeks in June, so I try to use them as much as possible. Thanks to Talmar and Belvedere Farm for providing us with these beautiful flowers! Special thanks to Heather Coburn Photography for the fab pictures of Ikumi and Chris. Congratulations to Ikumi and Chris! Wishing them much happiness in the years to come! On Wednesday, as part of the Association of Specialty Cut Flower Growers conference, I got to go on a tour of Farmhouse Flowers in Brookeville, Maryland. Granted, I do make it out there most weeks to pick up flowers, but this was a different experience all together. First, there were probably 150 flower farmers there. It was so fun (and educational) to walk the farm with so many talented, passionate growers. Everyone loved comparing notes on how, when and where to plant a LONG list of annuals, perennials and woodies. There was also alot of design discussion-which I loved. Next, since I wasn’t there for “business” (picking up flowers), I was able to take my time there, instead of rushing on to my next pick-up. It was kind of hilarious listening to Dave’s stories and his business tips. I was also able to tour all the greenhouses, hoophouses and fields. Of course, I was keeping my eyes open for what will be available in a few weeks for Thanksgiving as well as what will be coming this Winter and Spring. It was really a great way to spend an afternoon! So, I’m finally here! When I agreed to speak at this year’s conference for the Association of Specialty Cut Flower Growers, it was months and months away. But sure enough, weddings are over for the season and here I am in Reston Virginia spending a few days with some pretty amazing people. When I first arrived, I headed straight to the Design Competition room. This was an ordinary hotel conference room filled to bursting with flowers that growers brought with them from all over the country…flowers I’ve never seen and all kinds of things I wish we had more access too locally like artichokes and safflower. The idea for the Design Competition is that everyone uses the flowers to create a design of their choice. This year, the theme was “Raising the Jar” and all of the designs were made in Mason Jars. It was a great time visiting with friends from Farmhouse Flowers, Love n’ Fresh Flowers and M and M Plants. It was also really inspiring to see everyone’s designs. So here is my submission. What do you think? No real flowers. Mostly grasses and foliage but I still thought the colors and textures were so pretty. After the design competition, I headed over to the welcome reception where there was a lively discussion about the future of the flower industry and the Association of Specialty Cut Flower Growers. Today I’m looking forward to a full day of conference sessions, seeing some of our growers like Bob Wollam of Wollam Gardens and meeting new people!